Recently I have discovered the glory that is the AWESOME Dungeon Crawl Classics RPG system. Sadly I have yet to run a game of it (soon my pet, soon), but I loved reading the rule book (so much so I read it in two afternoons). I love its philosophy on mechanics, magic, monsters, magic items, etc. When reading it I realized that this system seems like it would be a perfect fit for my Hubris world (we’ll see once I’ve ran it a couple times, but I don’t see it not becoming my system for Hubris). So I’ve started the long haul of converting my notes and stuff over to DCC- which means Race as Class. I’ve drafted notes for each of the races of Hubris: Mutant, Kenku, Lizardfolk, and Half-Demon. Today I took a stab at Kenku. As always feel free to leave CONSTRUCTIVE criticism and opinions. Kenku is race of humanoid crows and ravens. They range in height from 4’5” to 5’5”. The culture of the kenku seems bizarre to outsiders. Kenku tend to be secretive and exhibit a magpie mentality for hording items and mementos- even if they may seem like junk to others. Other cultures tend to distrust the kenku as they like to use their natural ability to cast illusion magic to put one over on an easy mark, or operate as spies or assassins. Kenku like to travel in packs and enjoy experiencing different cultures and customs, but rarely give information about their own. They love items and will often take on dangerous jobs if they believe it will get them rare and precious (to them) trinkets. The homeland of the kenku lies in the Realm of the Echo Forest, which is in a strange and perpetual twilight shroud. Weird telepathic creatures that can fire mind bullets lurk in the forest, with slathering maws and jagged teeth, seeking to rend meat from bone; feather from flesh. The kenku have established a peaceful relation with the monks at the Temple of the Lucid Dreamers. 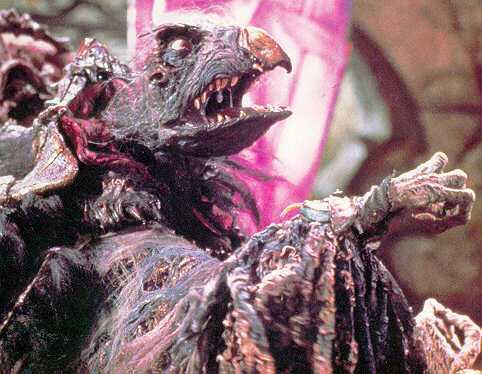 The kenku government is that of the Avian Court, currently lead by the ancient and bitter Lord Vivar who wears the Feathered Crown, and shall be called Lord until the Final Molting and the crown is bare. The Raven Clutch is the mysterious and enigmatic recorders of kenku secrets, prophecy, and lore. It is of the highest honor to become a member of this ancient group that serve the Avian Court and the Lord. 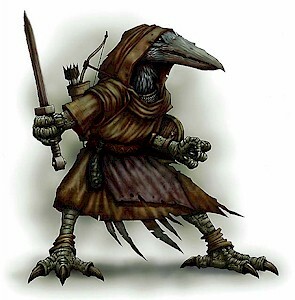 Weapon Training: A kenku is trained in the use of blackjack, crossbow, dagger, dart, shortbow, and short sword. Kenku tend to wear light or no armor as it impedes their ability to cast spells and fly. Alignment: The kenku race is split with a strange duality. Those that seek to preserve the traditions of their culture and bring the reputation of the kenku to a better light are Lawful, while those who seek constant gain, trinkets, or are shisters tend to be Chaotic. It is extremely rare to find a kenku who is neutral. Flight: The arms of a kenku are also his wings. A kenku can fly at a rate of 60ft per round. A kenku cannot fly if they are wearing any armor other than Padded, or having an abundance of items and weapons. Use common sense. A kenku can also burn a point of luck to make another target unlucky. The target gets a Will save (DC equal to the kenku’s Wisdom score), if successful the target cannot be affected by this again for 24 hours. If the Will check fails the target has been jinxed and must roll their next attack, save, skill check twice and take the lower of the two. Low-Light Vision: A kenku can see in near dark conditions normally up to 30’. Transformation: Once a day a kenku is able to transform themselves into a human form (this human form shows all scars, corruption, and deformities that the kenku has gotten through their rough and tumble journey). This transformation is truly horrible to witness as bones jut out and pus and strange clear liquids and blood spew forth from the body. Any target that witnesses this transformation must make a Fort save DC 12 or become nauseated, suffering -2 to all rolls for 1d6 rounds. This lasts until dispelled, even going into the next day(s). Illusionist: Kenku have the ability to manipulate arcane magic and cast a limited number of spells that deal with illusions or compulsions (see available list below). A kenku uses the normal rules of casting arcane spells (including spellburn), and can suffer any and all of the negative effects associated with dabbling in magic. When a kenku gains the ability to cast a new spell they roll randomly (see below). Roguish: A kenku selects four Thieves skills at level one and levels them up as a rogue of same alignment. This entry was posted on Saturday, February 23rd, 2013 at 3:28 pm	and posted in Dungeon Crawl Classics, Hubris Campaign Setting, Old School Role-playing, Role-playing. You can follow any responses to this entry through the RSS 2.0 feed. Looks good. Spotted two typos: should a ‘a Kenku can flight; be a Kenku can fly? and missed the word ‘see’ in the low light description. I think they have Thieves not Rogues in DCC, or is this a difference in your Hubris set up? On a quick eyeball they look like they might be a bit too good with the mix of racial abilities, rogue skills, and magic, but I’m not that familiar with DCC and don’t know Hubris so might be way off on that. Love the idea of burning luck to nix someone else very neat. Also think Kenku are very cool as presented here; though I’m an easy sell as I love Corvids. Yeah, there is a slight chance that they might be better, but I did try to limit it (IE 2nd level spells and only choosing 4 rogue abilities), but yeah they may be OP. I’m pondering just giving them access to one spell that they roll at level one. It can be a level one or two of those spells and that’s it.. We’ll see. Well, like I said, I’m new to DCC RPG and don’t know Hubris so I could be off the mark (or way off the mark). Vet crunchy gamer and proponent of custom classing here. IMO your build is totes OP. You’ve done a excellent job of flavouring the class, and I’d love to play an underleveled one in a mod sometime, but I call OP due to the high number of options [and spells] this class has in any encounter. I see cautious veteran players PCing a Kenku in a matched-level mod being pretty much unkillable in combat – short of monster critspam of course. My advice, take some of the appropriate spells from your list and reword/flaovur them as class specific spells and give them strong penalties for overuse or failure. That way the PC can still do those awesome things she imagined, but will be emotionally hesitant to do so [and when employed, the resulting sacrifice will make the moment all the more memorable to the party]. This will encourage creativity in encounters, improve players RPGing skillset, and will reduce the reliance on a high roll PC for success. @CrunchyRolling- Thanks! I agree that this class needs to be reworked. I have several notes/options that I’m considering before final publication. I’m gonna review them with some of the wizards of DCC that I talk shop with and see what they say:).. Hopefully the final Kenku (now called Avarian) will be a better DCC fit.